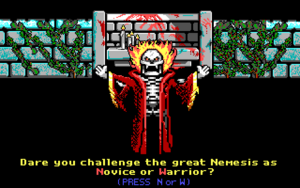 Nemesis is the main antagonist and final boss of Catacomb 3D and the Catacomb Adventure Series. An arch lich and necromancer, he is known for his skeletal appearance and propensity for evil. Nemesis has kidnapped Petton Everhail's friend Germlinar and entrapped him in an amber casing. Everhail must ascend Nemesis's keep and rescue his friend. Following his apparent demise, Nemesis' minions erected a mausoleum in his honour, but what truly lies within and beneath? Nemesis has returned once again, and is now making clones of himself. Accessing time portals, Nemesis is on a quest to conquer history itself. Can he be stopped once and for all? This page was last edited on 18 June 2018, at 03:29.